Check out Easybook now to get low-cost bus tickets with Trans MVS Express! Trans MVS Express guarantees a safe as well as pleasant bus journey to your travel destinations and bus tickets can be conveniently booked online at Easybook with less of a hassle. 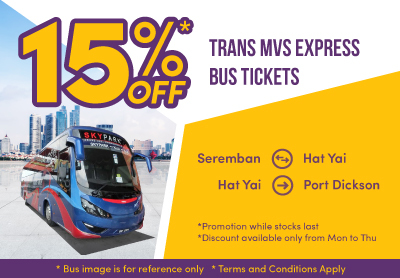 Get a chance to enjoy a discount of up to 15% for all bus tickets with Trans MVS Express today! From Monday to Thursday every week, Trans MVS Express offers discount bus tickets so that everyone can travel at a smaller price. Trips offered include a round trip from Seremban to Hat Yai as well as a new route from Hat Yai to Port Dickson. Embark on a journey to Port Dickson conveniently by booking a bus ticket with Trans MVS Express and enjoy great deals on cheap bus tickets while stocks last. Book your bus tickets on Easybook now to experience a comfortable ride with Trans MVS Express!